To be successful in a workplace, communication is a critical, but very often, a neglected part of a person’s skill set. It is commonly seen that a person may be highly qualified, efficient and very good at his or her work but fails to find success or recognition because of either a lack of communication or faulty communication. Of all the communication skills, writing skills are, probably, the most underestimated but the most important. Bad writing of reports may lead to mis-communication, ambiguous messages or even a wrong message. Writing skills are fundamental in business. The importance of good writing starts from the time you write your resume or CV and forward it to an employer for consideration. A well written cover letter and resume will catch the eye of a prospective employer. 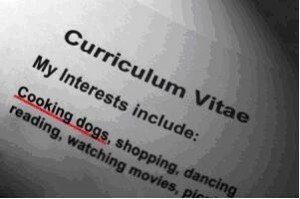 A CV with a number of grammatical mistakes, incoherent thoughts and disjointed sentences creates a negative first impression on the interviewer. Have a look at how this CV must have looked to the reader. For those in a job, reports are required to be written frequently, presentations are to be made, even confidential reports need some writing. There may be applications for as simple a thing as asking for leave or more complicated ones like preparing a detailed project report, writing a press release or even the minutes of a meeting. A good report will present all the facts in a manner that is lucid, correct and easy to understand. The reader must be able to understand exactly what the writer wants to convey. This can be achieved only by a well written report. Many times, the essence of the report gets distorted by a wrong choice of words or even by simple grammatical mistakes. A simple omission of an ‘e’ may lead to a result of ‘not approved’ from an intended ‘note approved’! There is likelihood of misinformation if a report is badly or shoddily written . Many of us think that in this age of email and sms texting , writing can be slipshod and correct spelling does not matter. Furthermore, the nature of business writing has become casual which is not actually correct. In fact, garbled, unclear, poorly and hastily written emails cause loss of time, money and productivity. Now that we have learnt how important it is to be good at writing ,the next question is what is good writing and how can it be achieved . One of the most important considerations when writing is the purpose.What is the purpose of the writing ? Is it to describe an event? Is it to argue a case? Is it to put up the facts of a case? Once the purpose is known , it becomes easier to have a well written piece of work . The second point to note is the person, or persons who will be reading it i.e the audience . The style of writing will differ with the target group. Putting up a report to the Chairman and putting one up to your immediate boss will require different styles of writing. Another important attribute of a good writing is that it should be able to hold the reader’s attention. It should be engaging. The reader should not lose interest while reading it. Good writing should have focus. The writer should not meander but stick to the purpose for which the report or writing is being done. It is easy to get sidetracked or to stretch a point too much. The writing should be sharp, direct and to the point. A well written piece should be free of grammatical mistakes. The vocabulary should be well chosen and slangs should be avoided at all costs. Experts caution against overly formal and stiff writing and the use of clichés such as ‘at the end of the day’, ‘last but not the least’, ‘in a nutshell’. An effective way of achieving good writing skills is to read. Read good writing and also read the bad writing. Learn to know the difference and then adopt the good writing skills. Pay attention to the grammar and vocabulary. Practice writing and revise what one has written. Always maintain simplicity of style. Good writing should have accuracy, clarity, spelling, punctuation, grammar and conciseness. An office assistant or an office executive or an office administrator takes care of all the tasks ranging from reception handling to day to day office work. The key highlights of such a resume can be the multitude of tasks handled which span documentation, people management and customer relationship building. These skills if done in a meticulous way add to greater customer satisfaction and smooth functioning of the office work. A person with an attitude which is friendly, proactive, approachable and has strong work ethics suit well for the job. Looking for what’s not right with your resume, looking for how resume could be made better ? Avail our free evaluations services for getting the report. The procedure is very simple. You just have to send your resume in mail at WritingService88@rocketmail.com and we will get back to you in 2-3 days. Please also visit our Resume Services page. Some question/answers on Resume / CV ; that might show some more focus on the importance of Resume/CV. Why is Resume / CV so important ? Resume is the most important tool if you are looking for a job or even if you are looking for a promotion in your existing job. The big question is arised , why is that ? well, its because your resume is going to show case your capabilities, your competencies, your strength, your experience and testimonies of the same. Just by reading through your resume, others would know about you and what you are capable of. Whats the difference between Resume and CV (Curriculum Vitae)? Resume is basically a short descriptive summary of academics and work history and events. Where as CV is a detailed summary of academics including the projects, papers, research etc. including the detailed history of work and previous experiences. Where Resume is used and where CV is required ? Although there is no such distinction as to where resume and where CV shall be used. But generally Resume is used for the professional jobs like Engineering, Information technology, Sales, Marketing, Assistance, administration etc. Where as CV is normally used for professionals like Doctors, Professors, Research scholars, teachers, Business personnel.